CEMEX has announced the completion of the EURUS wind farm construction project, which comprises 167 wind turbines and is located in Juchitan, Oaxaca, Mexico. CEMEX has been the promoter of this project developed by the joint venture between CEMEX and ACCIONA. Part of the energy generated by EURUS will supply approximately 25% of CEMEX's energy needs in its Mexican cement plants. ACCIONA financed, constructed and manages the wind farm. The installation of wind turbines in the park was initiated in July of 2008 and the wind turbines were connected to the electrical grid in February, 2009. After the conclusion of the assembly of the wind turbines, the wind farm will be operational in the coming weeks. The wind farm represents a major contribution towards the global effort that CEMEX is making to reduce its emissions footprint and to become more sustainable. 'Thanks to a transparent regulatory framework made by the Mexican energy authorities and the Mexican State power generation companies it was possible to develop the infrastructure and create the conditions necessary to develop the largest wind power generation project in Latin America,' he added. EURUS is located in Juchitan, in the Southern Mexican State of Oaxaca in a 2500 hectare area in the Tehuantepec Isthmus, an area well-known for its wind resources. The energy that will be produced by EURUS is estimated to be sufficient to power a Mexican city of half a million inhabitants, reducing CO2 emissions by approximately 600 000 tpa, which is approximately 25% of the total emissions generated by such a community. The project created more than 850 direct jobs in the area during the phase of construction and is generating an economic impact of more than 20 million pesos per year in the region. Cemex has lowered expected cashflow figure for 2009 to US$ 2.9 billion, compared to US$ 3.2 billion predicted earlier this year. 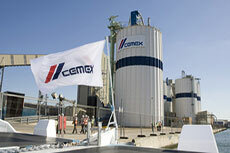 On 22 September 2009, Cemex opened a new cement grinding and blending plant at the port of Tilbury in Essex. 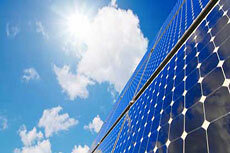 Statistics indicate that if less than 0.5% of the total area of sunny deserts in the world were covered with CSP plants, they would produce as much electricity as is currently being used by the whole world.